The Fellowship was fortunate enough to obtain a copy of CORKTOWN #1 from Alterna Comics. Mario Candelaria writes, Scott Ewen draws, and Zakk Saam letters. Torrie was a Detroit detective when the monster got her. She’s only a ghost now, but that doesn’t mean she stopped being a cop. And the thing that killed her is still out there, and it’s still killing. Until she catches up with it, all she can do is help the victims when they pass. So she bides her time, keeping track of her former partner and trying to get in position to kill the monster. As supernatural as this story is, it really still reads like a cop story. But it’s a really good cop story, with relatable characters (especially Torrie, despite being a ghost) and more humor than horror (the cops are hilarious). I’m looking forward to seeing how far into horror the story will go, too. And the art is really well done, with backgrounds dilapidated enough that I hope it’s worse here than in real Detroit. If mindless vampire-like killing machines are your thing, this is your book. And if you dig police procedurals, pick it up. Can’t go wrong either way. 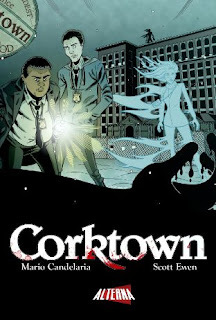 CORKTOWN #1 is available now on ComiXology or at alternacomics.com.